The 2015 women’s tennis team was among seven Hatter programs to score perfectly on the NCAA’s Graduation Success Rate Report. Stetson scholar-athletes who entered college in 2011 graduated at a rate of 90 percent, according to the figures released in mid-November as part of the NCAA’s Graduation Success Rate Report. This marks the fifth consecutive year Stetson, according to the report, has achieved at least a 90-percent graduation success rate. Overall, scholar-athletes across the country had a graduation success rate of 88 percent, up from 74 percent in 2002, which predates academic reforms put in place from 2003 through 2007. The national GSR has increased or remained steady in 15 of the past 16 years. 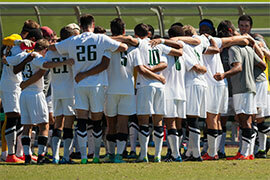 In this Graduation Success Rate Report, seven Stetson programs demonstrated a GSR of 100 percent: men’s soccer, men’s tennis, women’s cross country, women’s tennis, lacrosse, softball and volleyball. Three other programs posted a GSR of 90 percent or better: women’s basketball (92 percent), baseball (90 percent) and women’s soccer (90 percent). Note: Only those scholar-athletes who receive athletic aid are included in the annual NCAA report. Stetson’s football program, which is non-scholarship, and men’s rowing, which is not an NCAA sport, weren’t included in the report. The Division I Board of Directors created the GSR in response to Division I college and university presidents who wanted data that more accurately reflected the mobility of college students than the federal graduation rate. The federal rate counts any student who leaves a school as an academic failure, no matter whether he or she enrolls at another school. Also, the federal rate does not recognize students who enter school as transfer students. The graduation success rate is based on a comparison of the number of scholarship scholar-athletes who enter a college or university and the number who graduate within six years. The GSR account transfers and scholar-athletes who leave in good academic standing. This calculation makes for a more complete, and accurate, look at scholar-athlete success, according to the NCAA. The rate also allows for a deeper understanding of graduation success in individual sports than the federal metric, which provides only broad groupings. Since the NCAA began tracking GSR with the class of scholar-athletes who entered in 1995, the overall rate has increased 13 percentage points, which translates to nearly 23,000 more graduates than if the rate had stayed the same. In that time period, academic standards for Division I scholar-athletes improved multiple times, with increases in initial eligibility standards, progress-toward-degree standards and the creation of the Academic Progress Rate, a more real-time mechanism to track a scholar-athlete’s academic success. Meanwhile, Stetson is helping to set the pace. For more about scholar-athlete success at Stetson in the classroom, see the Fall 2018 issue of Stetson University Magazine, Page 52.